Meriwether Springs Vineyard & Brewery | O! The Joy! This is the original estate of explorer Meriwether Lewis, who was commissioned by Thomas Jefferson in 1804 to lead an exploration across the recently acquired Louisiana Territory and into the uncharted lands far beyond. After a long and dangerous journey, Lewis and his party reached the mouth of the Columbia River at the Pacific Ocean. Upon finally spotting the westward waters, Lewis and Clark penned their exuberance in an epic journal entry: “Ocean in view. O! The Joy!” In this spirit, with the thrill of adventure and the delight of having arrived at one’s chosen destination, we welcome you. Closed for the season. Please keep an eye on our social media pages for updates regarding our re-opening date! Fun Fact: The official name for Lewis & Clark's company of explorers was the Corps of Discovery. Fun Fact: The Explorer’s Bar features a 4-head traditional Czech beer tower, which we imported from Plzeň. It makes perfect foam. Fun Fact: Albemarle County was named after Virginia's first royal governor, the Earl of Albemarle. The name “Albemarle" refers to a white soil found in Normandy, France - once territory of the English king. Fun Fact: Meg celebrates her “birthmonth” instead of her birthday, which also happens to be during October…all of it. Fun Fact: The McMurdo Dry Valleys are the largest swath of Antarctica that isn’t covered by ice, with soils devoid of plant or animal life — except for strange bacteria that biologists say resemble what might be found on another planet. Fun Fact: The Federalist Party criticized the Louisiana Purchase as unconstitutional - the president having no explicit power to purchase land - and a waste of money to boot! The working vineyard is as functional as it is beautiful. Combining Old World viticultural approaches with the most environmentally sensitive modern farming methods, the goal of Meriwether Springs is to produce exceptionally fine wines consistent with the area’s established reputation as a world class wine destination. We are currently serving six of our own wines, including Pinot Grigio, Vidal Blanc, Heritage White, Chambourcin, Petit Verdot, and Apassimento Rosso. Come for a tasting, stay for a bottle! The Vidal Blanc grape has high natural acidity, making this a light and crisp wine with lush tropical notes. Our winemaker has maximized the versatility of this hybrid grape by maintaining the fruit flavors but keeping it dryer on the palate. A lovely, crisp wine with a fruity finish that lingers on the palate. This Italian style Pinot Grigio is dryer and lighter, making the flavors more vibrant and pronounced. A blend of Virginia white wines and Virginia apples, this fruit forward wine falls between off-dry and dessert style in sweetness. We seized an opportunity to work with another vineyard so that we could offer a sweeter wine for our customers who prefer sweeter over dryer wines. Enjoy this blend of the best in Virginia! The Chambourcin grape is a hybrid that thrives in our Virginia climate. Often used in blending, it also stands alone with its evocative herbal aromas. Notes of pepper and cherry distinguish this wine with low tannins and sufficient acidity for a robust finish. This distinctively Virginia wine is complex and alluring with a dense black fruit flavor. The bold tannins allow the wine to age beautifully, but it is also perfect at a younger age. A premium dry, rich wine in the Amarone style of production. The additional step of drying the grapes to an almost raisin like form produces bold flavors with a superbly velvety texture and softness. your choice of tomato, pesto, or olive oil base topped with our mozzarella-fontina blend and your choice of any two toppings: pepperoni, sausage +1, wild mushrooms, artichoke hearts, spinach, goat cheese +1. Add balsamic glaze upon request. 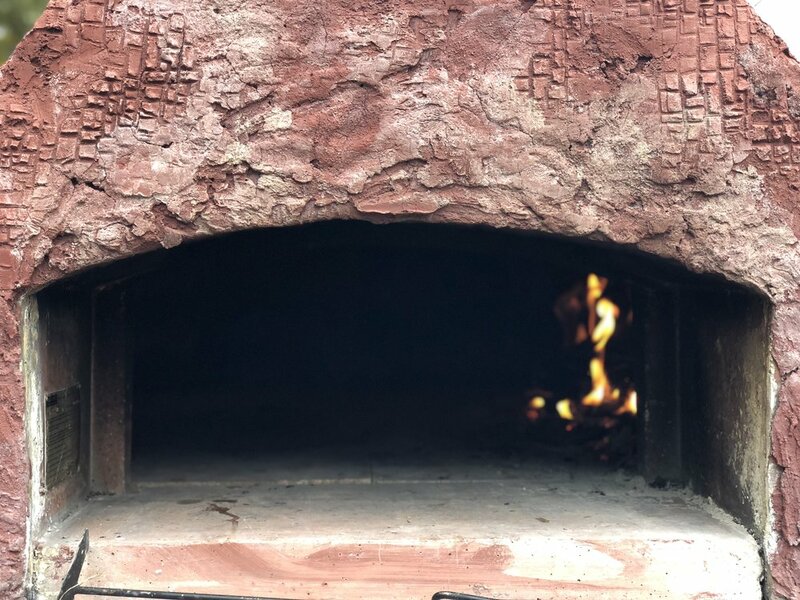 Our pizzas are prepared in the big green pizza bus, fired in our wood-burning Belforno oven, and served on a 10” flatbread crust. Substitute a gluten free cauliflower crust (yum!) under any pizza +$2.